Crosstalk: Are Oscar Prognosticators Evil? Noel: At the end of last year, I wrote a long blog post about how much I used to love the end-of-the-year list-making/list-reading process, and how I thought it had started to go sour. Well, now we're moving into another list season, and I'm determined to keep a more positive attitude about why we critics go on list benders at the end of the year. It isn't about consensus, it isn't about "being right," and no matter what some of our readers think, it's not about showing off how obscure our tastes can be. It's about taking a moment to reflect on the popular art that meant the most to us in the previous year, seeing how it all might be connected, then sharing those thoughts with readers and colleagues who enjoy ruminating about such things themselves. But there's still a snake in our listing Eden, my friend, and I think you know what I mean. It's those "Oscar prognosticators," the officious know-it-alls who take our lists and input them into a databank that, when consulted properly, reveals the nominees and eventual winners of this year's Academy Awards. These guys and gals aren't interested in predicting the Golden Globes, the Independent Spirit Awards, or the tabulated ballots of the Southeastern Film Critics Association. They only care about other awards and best-of lists inasmuch as they have an impact on the Oscars, positively and negatively. I used to think the OPs were a benign annoyance like hangnails, or the music of Jack Johnson. Now I think they may be a malignancy. I've got a couple of reasons for this change in perspective, but let's start with a biggie: Some OPs started the 2006 prediction season as soon as this year's Oscar ceremony was over. At first, I took this as good-natured, tongue-in-cheek self-ribbing, but as the year rolled on, and especially as we approached fall festival season, I realized that a lot of the OPs were measuring the movies they saw (or even just read about) against charts they made six months ago. Feigning objectivity, they turned every movie they liked into a front-runner—or vice-versa, I'm still not sure—and labeled every movie they disliked "dead." Never mind that the film might have some merit beyond its awards-gathering potential. If it isn't going to get a statue, who cares? Before I get to my next complaint, let's hear from you, Scott. Do you read the OPs? Do you have hate for them in your heart? Scott: I think I'm still at the hangnails/Jack Johnson stage, but I can see where you're coming from. Truth be told, I'm guilty of a little prognostication myself—it can be profitable on Oscar night, like when I scored a copy of the original Traffik DVD set via Tasha Robinson's Oscar-party contest last year. But I don't really see the point in doing it in any official capacity, much less months (or many months) away from the actual ceremony. The OPs at the Toronto Film Festival behaved like scouts in a rotisserie league: All The King's Men, Stranger Than Fiction, Bobby, A Good Year, Breaking And Entering—dead, dead, dead, dead, dead. In other cases, they were picking at the bodies like vultures, looking for those meaty individual performances that transcend a film's shortcomings (Forest Whitaker in Last King Of Scotland) or foreign-osity (Penélope Cruz in Volver). Taste dictates these assessments to a certain degree, but when a film gets deemed "Oscar-worthy," it's the furthest thing from critical advocacy. All it means is that a particular film has qualities that Oscar voters traditionally find attractive—a middlebrow sense of grandeur, a message that seems risky without actually being provocative, name stars emoting like crazy, and the potential for at least modest success at the box office. If the OPs have any effect on the process, it's really to enforce (rather than challenge) the status quo: Instead of doing something good for humanity, like asking voters to consider some movie or performance that really moved them, they're filtering everything they see for the same "Oscar-worthy" qualities that have made the awards such a useless barometer for cinematic excellence throughout history. And after awhile, being an OP really has to color your perspective: Good movies start to look bad because they fall outside the box, and vice versa. This year's 9/11 movies are a perfect example: With its pedigreed cast and director, the broad, shamelessly sentimental World Trade Center has been labeled an Oscar contender, while United 93, a rigorous vérité-style drama with no stars and an almost heroic aversion to "big moments" (can you imagine what Oliver Stone would have done with the "Let's roll" line? ), has been deemed an outside shot at best. Yet have you met anyone who prefers the former to the latter? Me neither. 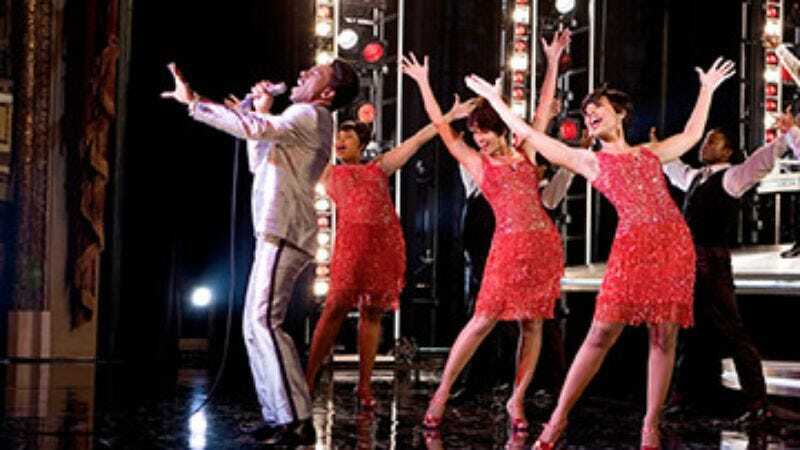 The big thing that's been sticking in my craw this year is that the OPs have already christened Dreamgirls as the Best Picture favorite, with supporting nods likely for Eddie Murphy and Jennifer Hudson, not to mention the scads of talent eligible in other categories. Here's the problem with this bit of speculation: Nobody has seen the film! There's a trailer out there that people seem to like, it has pedigree (writer-director Bill Condon adapted the screenplay for Chicago, another musical turned undeserved Best Picture winner), and it's been promoted with a certain amount of swagger. I'd probably concede that the OPs know this business on this one, even though I personally have been unimpressed by Condon's biopics Gods And Monsters and Kinsey, and can't imagine his middlebrow sensibility would bring much pop to a movie musical. But even if he did pull it off, wouldn't it be better to make that discovery outside of the context of it being the frontrunner in the Oscar horse-race? Noel: Yeah, this is the part I don't get either. It's one thing to speculate on a pre-season Top 25 for NCAA basketball. It's another thing to cede the March tournament before anyone's played a game. I suppose it can be a fun hobby, but what's so frustrating about the OPs is that there seems to be so little joy to what they do. It's all very wonky, based on inside information, number-crunching, and pretensions of expertise. These guys would rather be right than be happy about it. Why does it matter what they say? I think you've hit the nail on the head with your United 93/World Trade Center analogy. The clamor of OP voices directs attention away from films that might be too minor to register on the Academy's radar, but which might be eminently worthy of any serious cineaste's attention. And I'm not just talking about the little documentaries and foreign films that continue to open in major metropolitan areas in November and December—at the exact time that the OPs are dominating the conversation with their discussion of movies that won't open in most of the country until January and February—but also some awards-dodging Hollywood fare that might be genuinely entertaining. I'll never forget the year that Galaxy Quest opened in late December, while newspapers and magazines were clogged with their best-of-the-year coverage. In retrospect, Galaxy Quest was better than maybe half the movies that made my published Top 10 list that year. I know I'd rather see it again than American Beauty, that year's Best Picture winner. This year, when I look at the rest-of-the-year release calendar, I've been taken aback by how many titles I know almost nothing about. Let's Go To Prison? Deck The Halls? DOA: Dead Or Alive? Arthur And The Invisibles? We Are Marshall? Can these movies even exist if they don't have Oscar campaigns? What about you, Scott? Can you keep your head about you while everyone's telling you which movies are really important? Or do you have a little checklist of as-yet-unscreened movies that you feel you have to see before you make any kind of pronouncements about "the best of '06?" Scott: I'll admit that I have a little checklist—this year, there's still The Good German, Children Of Men, Dreamgirls, Breaking And Entering, Inland Empire, and Perfume left to see, and plenty of others that I missed the first time around—but only because I'd prefer to see as many of the year's considerable (i.e. well-reviewed or pedigreed) films as possible before knocking out a "Best Of" list with commentary. It really has nothing to do with the Oscars, though it's always a reality of the season that Hollywood is trying to put its best foot forward for the event. To go back to what you were saying in your introductory post about lists, I really don't consider end-the-the-year list-making to be in the same ballpark as Oscar prognostication, though I'll acknowledge that both activities entail a wonky devotion to inventory and order. There are two major differences, to my mind: The first is that putting together a Top 10 list (or any other such list) is a deeply personal venture. OPs are trying to figure out what other people are going to like—or more specifically, the stuff that Academy voters can endorse as a collective—but a Top 10 list reflects one's own taste in all its idiosyncratic glory. One of the annoying things about the OPs is that you never get a sense of what they like; instead, you get broad assumptions about what Academy members might endorse, colored only somewhat by an OP's personal biases. The second is that putting together "best of" pieces is an act of true reflection; I always enjoy the opportunity to look back 12 months and note the trends and themes that have emerged throughout the year. When you get pelted with hundreds of titles each year, you can easily lose perspective on the overall picture, and list-making forces you to take stock in how cinema culture has functioned as a whole, and what films have endured in your mind past opening weekend. The rise in Oscar prognostication goes hand-in-hand with the public's ever-increasing awareness of the business side of moviemaking. Just like those weekend box-office reports that are posted at virtually every entertainment site (including ours), movies aren't just about good and bad, they're about winners and losers, too. In this world, success isn't measured in aesthetic worth, but in dollars and cents, and the awards that may or may not await a film at the end of the line. My standard line about great films that bomb is always, "Hey, at least it got made," but I'll admit my guilt in keeping track of the box-office/awards race. Partly, you're tempted to see some sort of justice in a good film's success and a bad film's failure, but mainly, these results can be a strong indicator of what types of films we can expect (or not expect) to get made in the future. The difference is that the "winners" and "losers" for OPs aren't necessarily winners or losers as far as their aesthetic achievement, but only insofar as they fit into the tired old "Oscar-worthy" paradigm. And when you're the one making conclusions based on this paradigm, you're part of the problem, I think. Nevertheless, the OPs are getting more space (or bandwidth) lately, not less. What gives? Noel: As much as it pains me to say it—in part because it sounds like sour grapes, and in part because it's almost too big a topic to tack onto this discussion—I think the rise of the OPs corresponds with the rapid decline of film criticism in the mainstream media. Film critics are being fired left and right these days, and not always replaced, for a variety of reasons: because the old guard costs too much, because bad reviews irritate the show-business folk who spend money on newspaper ads, and because the general readership is often more interested in puff pieces about movie stars than raves for snail-paced Taiwanese films. Plus, there's a sense that the blogger revolution has rendered professional film criticism irrelevant. When everyone has an opinion and a forum to express it, why pay some egg-headed film-studies grad a reporter's salary to provide content that isn't exactly unique? At the moment, the OPs are unique, or at least they've convinced enough newspaper editors that they are. The big media outlets have been adding Oscar columns and blogs almost at the same rate that they've been cutting back on critics. It's a scary trend—replacing overt opinion-writing with covert opinion-writing, passed off as objective reporting. To be fair, most OPs aren't exactly studio shills, and they have enough integrity to savage the awards-bait that doesn't pass muster, even if publicists threaten to shut them out of future screenings as payback. And I suppose one could argue that by focusing only on "Oscar-caliber" movies, the OPs are drawing reader attention to the best of the best of the film-industry releases. But as you've already noted, that isn't really the case, since the Oscars are as much a measure of politics and public relations as they are of artistic quality. Anyway, there's a distressing unanimity to what the OPs write about. Eventually, it all narrows down to the same dozen or so films, judged not so much on what they mean to the writer, but on what they might mean to a group of people not even in the screening room. And the only question in film criticism more pernicious than "Will audiences like it?" is "What will the Academy think?"